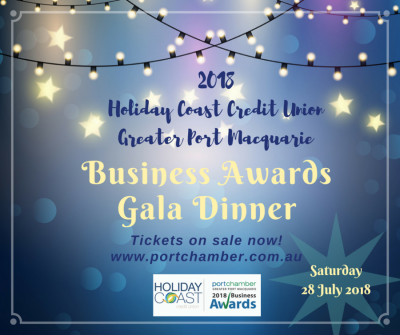 The Gala Awards Night is widely recognised as the premier event in the Port Macquarie business calendar. Over 500 members and guests of the Port Macquarie Chamber of Commerce attend to share an evening of celebration and achievement with staff, colleagues, family and friends. Boasting celebrity MC’s, a gourmet three course dinner and award-winning local wines, it is an event not to miss. It’s a wonderful opportunity to share in the achievements of our local business community and dance the night away with friends and associates. The ‘Oscars’ of the Hastings LGA, this event is your chance to dress up and put your business’ best foot forward. Click here to buy your tickets. They will sell out to so get in quickly! Ticket includes welcome drink on arrival, a 3 course meal, complimentary table wines, live entertainment, Awards presentation, incredible networking opportunities and attendance to Greater Port Macquarie’s premier business celebration! Please note tickets all tickets need to be paid for by Thursday, 19 July and are non-refundable from this date.